DERRY -- The Auburn School Board has approved a 20-year contract with Pinkerton Academy to send the town’s high school students to the Derry school. If the contract is approved by Auburn residents at the annual school district meeting in March, the town will begin reducing the number of teens attending school in Manchester as early as the 2013-2014 school year. SAU 15, which includes Auburn, Candia and Hooksett, pays tuition to send its high school students to Manchester. About 200 Auburn students attend Memorial High School, four attend Central High School and two are at West High School. For each student, the city’s school district gets $8,300. This means Manchester stands to lose about $1.7 million per year if Auburn sends its students elsewhere. If voters accept the contract, Auburn would give the required two-year notice of termination. In September 2013, students entering their freshman year of high school would attend Pinkerton, while the upper classes would finish high school in Manchester — similar to the arrangement the district made when Bedford built a high school and moved its students from West. Manchester School District was notifi ed of the decision via letter. The decision took the members of the Manchester Board of School Committee by surprise, especially because SAU 15 and Manchester have been meeting regularly to discuss changes and improvements to the city’s high schools. The Joint High School Committee met in April and the two districts discussed creating a charter or academy school at West High School. More than 150 parents attended a school board meeting about switching to Pinkerton in May. Parents said they supported the move because of more extensive course offerings at Pinkerton and worries over budget cuts in Manchester. Hints that Auburn parents wanted to send their students elsewhere also emerged earlier this month. Mayor Ted Gatsas brought in legal counsel to the Nov. 8 school board meeting to discuss whether Auburn’s high number of petitions to move students to Pinkerton for a “special exception” was violating the contract between SAU 15 and Manchester. Attorney Brad Cook said it likely was, since exceptions are only to be granted on a caseby- case basis; more than 100 students from Auburn now go to Pinkerton. “If there are students being sent out of this district to other high schools and the sending towns are paying for them, that’s a loss of revenue for us,” Gatsas said. For the past several years, Pinkerton has asked boards to consider bringing select groups of Auburn students into the school, an idea that Derry School Board Chairman Kevin Gordon said has been met with some resistance in Derry. Pinkerton doesn’t need permission from its current sending schools to open a new contract, but each sending school board must sign off on requests to allow off-contract students to enroll. With assurances from Pinkerton officials that Derry students would not lose out, Gordon said the board voted to allow several dozen Auburn students to enroll this fall. “It’s a Catch-22 because we have to allow students to come in to PA to keep the tuition down,” he said. 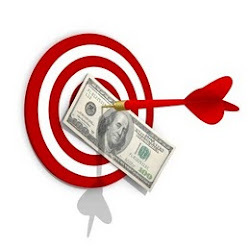 Derry has yet to be officially notified of the Auburn contract proposal, but Gordon said he’s open to the idea if it will bring down costs to Derry taxpayers. Pinkerton officials have outlined a $34.9 million budget for next year that would cut nearly a dozen faculty positions and increase tuition by 3.65 percent to $9,712 per student. Total enrollment for next year is projected to reach 3,100 students, down 130 from the current year. Gordon said Pinkerton staff have said that 3,800 students is a more ideal target to fill out the school’s current infrastructure. And with a new freshman academy building coming online in August, Pinkerton could use the extra students, said Robin Perrin, who spoke on behalf of the school Monday. Desiree Bassett, above, and Dan Lawson Band perform Dec. 4 at Tupelo Music Hall for Bella Tucker benefit. LONDONDERRY -- Organizers are hoping the healing power of music will help make this holiday a little brighter for 9-yearold Bella Tucker, who continues to recuperate at home following a radical, life-saving quadruple amputation in April. On Dec. 4 Tupelo Music Hall owner Scott Hayward is hosting, “Power for Power: A Benefit for the Amazing and Powerful Bella Tucker,” featuring two powerful guitar-driven New England originals — Massachusetts- based Dan Lawson Band and Connecticut rising star, singer-songwriter Desiree Bassett.Hayward hopes the community will take the time from the hustle and bustle of the holiday season to enjoy a hard-rocking musical interlude for a great cause. In April, Bella was stricken with a sudden illness, streptococcus pneumonia sepsis, a bacterial blood infection affecting her circulation. Although she recovered, the extent of tissue damage to her extremities left her doctors with no alternative but to amputate the lower portion of both her arms and legs. Since news of her illness, the community has rallied to her family’s aid, mounting a number of fundraisers. The outpouring has included the renovation of her home living space as she continues to recover and learn to navigate her world in a different way. 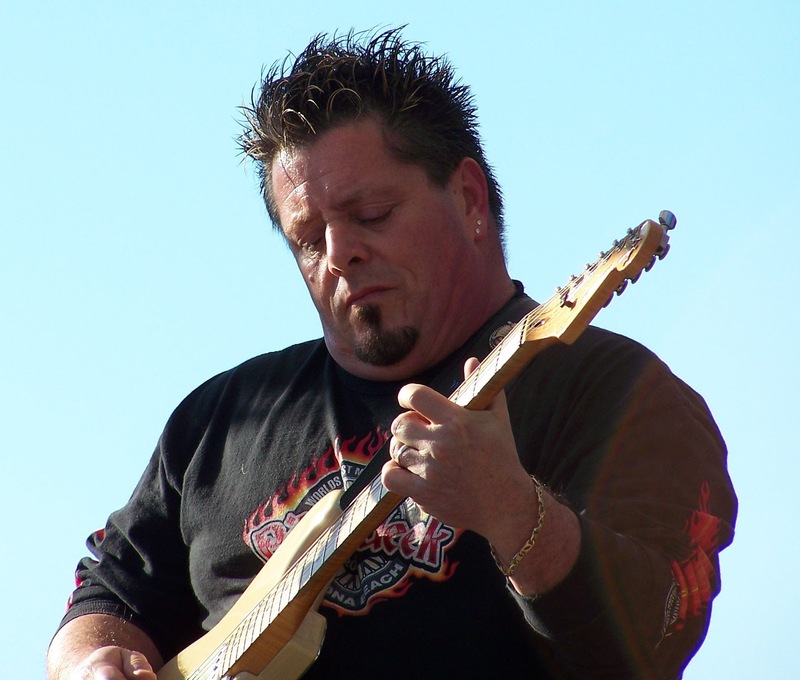 Hayward said Saturday’s musical fundraiser will appeal to anyone who loves music — particular that of gifted guitarists. Dan Lawson Band has become a fixture at some of the country’s preeminent blues festivals and gigs in the Boston blues scene. 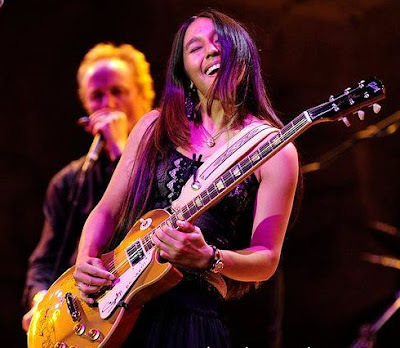 Desiree Bassett, 18, was considered a guitar prodigy at 3 and has continued to build on her early foundations in music, having shared a stage with some rock greats, including Ted Nugent, Marshall Tucker Band and Sammy Hagar. She just released her third CD and continues to write and perform an impressive catalog of original music. Dr. Thomas Scott, Emergency Room Medical Director. DERRY -- After 10 months of getting settled in at the helm, Parkland Medical Center CEO Tina Legere is ready to put her hospital on the map. Despite another year of top industry- wide ratings for patient care, Legere knows that her 86-bed hospital is easily obscured by its much larger counterparts in Manchester and Boston. One of her favorite statistics to quote is “door to balloon time,” which indicates the time it takes a patient arriving with a blocked artery to find relief with a balloon catheter. “It’s 68 minutes — that’s well below the standard best practice of 90 minutes,” said Legere, noting that it is the shortest wait time in the state. “If you’re having a heart attack, you don’t have to drive past Derry to get to Manchester or Boston,” said Legere. Parkland, owned by Hospital Corp.
of America, operates hospitals around the country including Portsmouth Regional Hospital and outpatient centers in Portsmouth and Salem. Legere is also proud of her hospital’s relationships with the New England Heart Institute and Lahey Clinic — providing what she calls “top-notch patient care,” all at a little community hospital just off the beaten path. In speaking of the CMS core measure ratings, Legere said it’s important because the ratings are based on standards applied uniformly, regardless of a hospital’s size or patient base. And while most hospitals in New Hampshire score well, it’s still an important and objective indicator that a hospital is doing its best in critical- care situations, said Dr. William Kassler, chief medical officer for the New England region of the Center for Medicare and Medicaid Services, which operates under the U.S.
“Although New Hampshire as a whole does well when it comes to outcomes and quality of care, we know across the country the error rate is higher than what patients would demand, and we know we can all do better,” said Kassler. Having a standardized set of measures becomes a way to increase public accountability while also helping hospitals promote what they do well, which is meaningful for both patients and staff, Kassler said. Legere came to Parkland after spending many years as chief quality officer for a competing Manchester hospital. But it is her roots in medical social work that have kept her grounded in what a hospital’s mission is all about. “Being in the trenches helped me understand what it is that patients need. It’s given me a great appreciation for how all the various systems within a hospital work together to achieve that,” Legere said. “I know that physicians have a choice about where they work and patients have a choice about where they seek treatment, which is why it’s important for me to keep my finger on the pulse of what both patients and staff are saying,” Legere said. To that end, she goes on rounds with physicians as often as possible for direct feedback from both patients, doctors and support staff. In addition, patients are invited back, post-treatment, to talk about what worked and what could have gone better. to the library book cart drill team. DERRY -- This weekend, Derry Public Library staff will take their book carts to the streets to show patrons they can really mix things up. And with Dr. Seuss hats, embellished book carts and a drill team routine choreographed to music from The Grinch, library staff will march in their first-ever annual Holiday Parade on Saturday. “We’d never done it before, but when we saw the theme, it was one of those opportunities we couldn’t pass up,” said Cronin, who will be dressed as The Grinch for Saturday’s parade as she shouts out drill team commands. Group members have been meeting after hours for two months to practice their three, 2-minute long choreographed routines, which include line formations, spins and shouted cadences. And while the library drill team is new to Derry, organizer Nancy Chase said the phenomenon has been a big hit at library conferences for years. Chase said she had seen library drill teams on Internet videos, but never in person. To put together her routines, Chase turned to a book published on the subject — The Library Book Cart Precision Drill Team Manual. “I’ve never done anything like this ever and had never seen it in person, but the manual was so well written it made it easy,” said Chase. The library drill team will join numerous other floats for Saturday’s parade sponsored by the Greater Derry Londonderry Chamber of Commerce, which begins at 1 p.m.
More than 80 floats, bands and marching units are expected to parade down West Broadway and ending at Hood Commons on Crystal Avenue. Directly following the parade, the town’s parks and recreation department will host its Very Derry Holiday Event at Veterans Memorial Hall on West Broadway, with children’s crafts and games beginning at 2 p.m. A tree-lighting ceremony and carol singing will begin at 5:15 p.m. outside the Adams Memorial Opera House. DERRY - Last Thanksgiving, Lisa Luz of Derry watched the sea of runners in the town’s annual turkey trot pass by the window of her Beaver Lake home, where she was recovering from a bilateral hip replacement surgery. “I could barely walk, but I said I’m going to do that next year,” Luz, 40, said of the race. And after a year of training, she did. 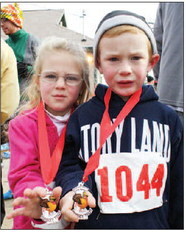 show their medals after finishing their first 5K race. Luz’s husband, Dave is also new to running this year, and said he wanted to come out to support his wife in reaching her goal. Thursday’s 3.1-mile race attracted more than 1,700 runners to Beaver Lake in Derry, collecting canned goods for local food pantries and raising money to support Derry-area charities. And while racers say “turkey trots” are popping up all over the place in recent years, runner Sara Brandt of Worcester, Mass., said Derry’s event draws one of the biggest crowds. Brandt completed her second Derry Turkey Trot this year. 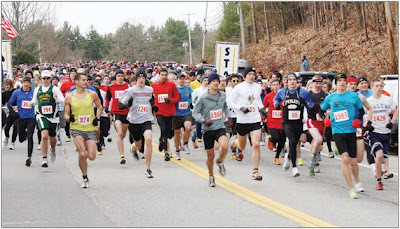 “Turkey trots wake you up and make you feel not so bad about eating so much later on, and Derry’s has such a big crowd,” Brandt said. Carol Ewell of Derry spent the morning serving up chili and potato casserole to runners after they completed the race. Ewell’s husband, Jim, is the race’s director and she has been involved for many years. When Marge Olson of Lebanon was looking for a turkey trot for her family last year, she said Derry’s event provided a reasonable price and supported a good cause. “I like that they give food to the pantries because this can be a great fundraiser, and we can all be together,” said Olson, who ran Thursday’s race for the second time with her extended family from both Lebanon and Chester. The family of 10 all wear handmade turkey hats to set themselves apart. And while there were plenty of novice runners on scene Thursday, the race also attracts more seasoned athletes like 25-year-old Julia Huffman of Manchester, who was the first woman to cross the finish line with a time of 19:13. Jennifer Connors of Derry brought her daughter, 9-yearold Emily, out for their first race Thursday after hearing about the event around town for several years. including a wheat-based dish, seitan, pictured here. DERRY – As holiday traditions go, Thanksgiving is about as symbolic as it gets – copious amounts of food representing nature's bounty, families finding their way to one another with magnet force just to sit around a table together and give thanks like modern-day Pilgrims for another year of more ups than downs, all enhanced by a constant loop of televised football. For more than 400 years this poultry dish has been a persistent presence at the center of the feast. Dumb luck, really, considering wild turkeys were simply prolific enough to be plentiful in 17th-century America, and not terrific at flying away at the sight of a loaded musket. enjoy a "Gentle Thanksgiving together. However, times have changed. America has never had so much information about what it eats, how many grams of fiber, fat and cholesterol our food contains, and how corporate farming works. Critics will point to how a monopoly on mass production contributes to resource depletion, and have documented the way animals intended for consumption are propagated, handled and slaughtered, none of it pretty. Locally, the New Hampshire Animal Rights League is urging the public to rethink what it brings to the table this year, and they are leading by example, having recently hosted a Gentle Thanksgiving feast with all the traditional trimmings – sans turkey. The spread at the Marion Gerrish Center featured seitan (pronounced say-tahn) roll – the other wheat meat – a food product made from wheat protein and prepared in various ways to mimic the texture and flavor of meat. About 30 dinner guests contributed dishes, all vegan, from pumpkin soup and several incarnations of sweet potato, to cornbread, stuffing and a number of non-traditional but savory sides. Emily Murphy of Dover broke gluten-free bread with three of her four other family members during the veganfest, her mom Mary, sister Melissa and brother RJ. Only her dad Ray, the family's hold-out meat eater, abstained. “He's open to how we eat and trying the food, but he still eats meat,” said Mary Murphy of Bedford. She traditionally serves up a dual Thanksgiving dinner concentrating on the vegan dishes her three children prefer with a side order of poultry, for her favorite meat eater. “Last year I cooked a local turkey from Twist of Fate, a farm in Dunbarton. But it closed over the summer. I was pretty upset about it. At least I knew they raised their animals with heart,” Mary Murphy said. Her daughter Emily was the first to eliminate meat from her diet. Her first awakening was back in high school, after learning about veal production. But it wasn't until she watched a 2004 documentary called “Peaceable Kingdom” several years ago that she was able to go meat free without remorse. NHARL board member Linda Dionne said that while their organization appreciates the more humane treatment of animals on small-scale family farms, their mission is protecting all animals all the time, which means they promote a vegan diet as the most cruelty-free lifestyle. When she gave up meat in 1973 the world was just learning about some of the hazards of factory farming. Thirty years later interest in being better stewards of our food supply have gone mainstream, with tightening up of USDA standards and documentary films such as the 2008 “Food, Inc,” which is bringing more people into the meatless fold, not just on principle, but also because of America's ever-present concern over food-borne illnesses like salmonella and E.coli. And now, as baby boomers set the pace in lifestyle trending once again, the fullness of mantras like “you are what you eat,” have expanded the market for going green while eating more greens as a lifestyle, turning the traditional food pyramid on its side and relegating proteins and saturated animal fats to a minimized corner, making more room for whole grains, fruits and vegetables. Franklin veterinarian Dr. Barry Taylor attended the vegan dinner with his family, and offered up the pre-meal blessing, which he qualified as more of a rant, touching on a year's worth of local, national political and social ills and shortcomings. “... So this year when giving thanks, take a second to be grateful for the fact that here in America you can complain – it sets us apart, makes us better; it makes us right. Amen,” said Taylor, who went on to talk about his personal commitment to animals. “Why am I here? For a vet, that should be fairly obvious. I'd like to convince people not to eat my patients. Animal suffering in modern animal agriculture exists, and if people had to confront that there'd be a lot more vegetarians in this world. Unfortunately, we've become more isolated from the process of how we get our food,” Taylor said. Kathy Jacques of Londonderry has attended other Gentle Thanksgiving feasts. She likes them because they are a festive way of extending a new idea to people who may otherwise not realize how easy it is to eliminate the turkey while retaining all the goodness and tradition the holiday implies. 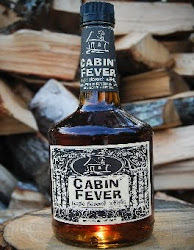 “Gentle Thanksgiving doesn't limit what people value – just animal fat. But it's sure hard changing people's habits,” said Jacques. LONDONDERRY -- Becoming a Radio City Rockette was the fulfillment of a childhood dream for Kerry Margolin, a Londonderry native who is touring with the Boston troupe of the worldfamous precision dancers, her third Christmas season as a Rockette. “I always knew this is what I wanted to do, from the time I was 6 and I saw the Rockettes in the Macy’s Thanksgiving Day Parade,” said Margolin. She started out a reluctant dancer at age 4, said Margolin’s mom, Linda Margolin, who encouraged her daughter to find her inner dancer. After a brief hiatus, she enrolled her at Melissa Hoffman Dance Center, where she found her footing. “I think becoming a Rockette, for Kerry, was a marriage of destiny and circumstance. You can’t be a Rockette unless you’re tall, and she’s 5-foot-9,” said Linda Margolin. 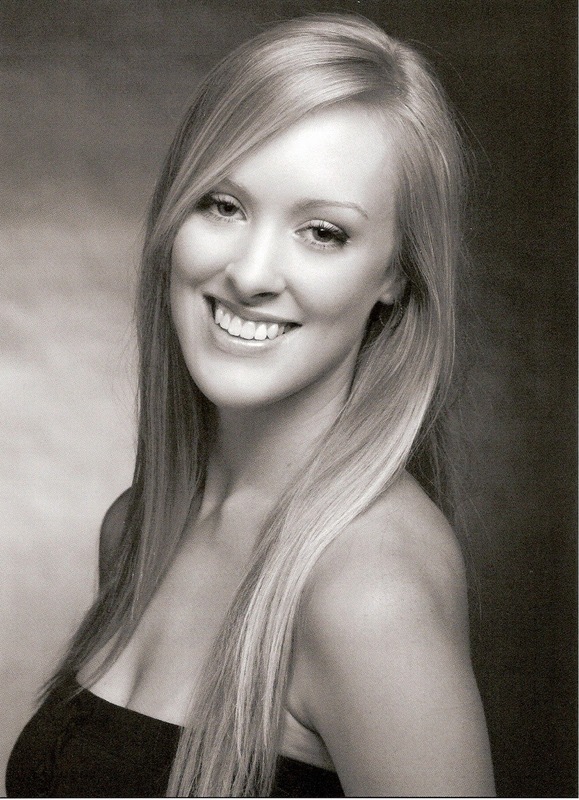 Her daughter danced competitively throughout high school, earning the Dance Masters Miss Dance New England title in 2003. “That’s when I think she began to think about the possibilities for her future,” said her mom. 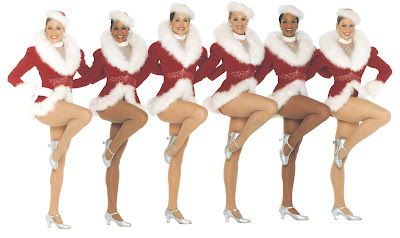 In 2006, Margolin caught the Rockettes’ Christmas show in Boston, and her childhood dream of being a Rockette manifested. She applied for the Rockettes’ summer internship program and earned a scholarship to train like a Rockette, solidifying her feeling that this was her calling. Radio City Christmas Spectacular will be landing at the Wang Theater in Boston for a three-week run starting Dec. 3. Being part of the show connects Margolin to a proud lineage of professional dancers that started in the United States in 1925, said Margolin. In 1994 the popular New York version of the Christmas Spectacular was expanded to include traveling troupes that perform simultaneously around the country. In her two previous seasons, Margolin performed in Buffalo, N.Y., and Seattle, Wash. It is a treat to be close to home this Christmas, performing with the Providence/Boston troupe, she said. Margolin graduated from Londonderry High School in 2004, and went on to the University of Arizona, where she earned a degree in dance with a minor in psychology. She auditioned for the Rockettes in the fall of 2008 and landed a spot in the coveted troupe, which features 55 singers and dancers — including the 18-member dance line. Margolin has also taught dance in New Hampshire, Arizona and to aspiring young dancers in Namibia, Africa, as part of an HIV/ AIDS awareness project. Understanding what makes the Rockettes such a phenomenon requires a lesson in dance troupe history. The concept of chorus line dancing began in earnest in late 19th-century England, where the idea of bringing together dancers of similar height to perform steps in straight lines that extended into geometric configurations was born. Entrepreneur John Tiller introduced his troupe to a Paris audience where the trademark high “pony kicks” associated with chorus lines debuted. Around the turn of the century, Tiller’s dancers came to the United States and were recruited for the Ziegfeld Follies. In 1925, a 16-member dance line debuted at the Roxy in New York City as the Roxyettes. By 1932, the Roxyettes performed for opening night of the new Radio City Music Hall, and the following year staged a Christmas Spectacular. Two particular routines from the original 1933 show, the “Parade of the Wooden Soldiers,” and “The Living Nativity,” have endured to this day and are still part of the annual show, Margolin said. Although she recently relocated to Arizona fulltime, her heart remains in New Hampshire, said Margolin. “The first time I stepped on the stage as a Rockette, it took my breath away. Tickets for the Radio City Christmas Spectacular are on sale to the public at the Citi Performing Arts Center Wang Theater box office, online at www.citicenter. 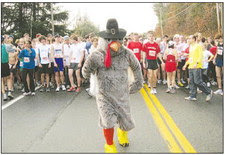 DERRY -- Hundreds of road-racers are expected to turn out for the 37th annual Turkey Trot on Thursday morning, before filling their bellies with Thanksgiving treats. The race, which is facilitated each year by the Greater Derry Track Club, will begin at 9 a.m. on Thursday at Galliens Town Beach at the corner of Route 102 and Pond Road. The nearly 2,000 anticipated participants will follow a 3.1-mile course around Beaver Lake in Derry, finishing back at the beach with an awards ceremony to follow at 9:30 a.m. But Ewell said the race is for runners and walkers of all abilities. And as the race enters its 37th year, Ewell said many of the original young racers are now sharing the event with their own children. “It’s all about tradition, and it’s a family thing,” Ewell said. “We’ve got kids and grandkids coming now because every Thanksgiving morning they say, ‘Let’s get dressed and go to Derry to run the race.’” Registration fees for adults are $13, or $17 to include a Tshirt and $3 for children under 11 years old. Participants are also asked to bring canned goods to donate to local food pantries. All profits above and beyond the cost of putting on the race are donated to selected Derry area charities, Ewell said. On-site registration and race packet pickup opens the night before the race, from 4 to 8 p.m. tonight at Galliens Town Beach. Ewell said he encourages local residents to swing by tonight to make it easier to process the large crowd on Thursday morning. Parking is available on site, but buses will also be running from Pinkerton Academy lots to the race site from 7 a.m. to 11 a.m. Thursday. For more information, visit www.gdtc.org/turkeytrot. 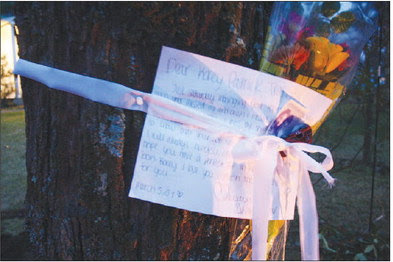 A note and some flowers are tied to a tree where 17-year-old Korey Traficante was killed Saturday night. DERRY -- Police are still investigating what caused a vehicle to swerve off the road and into a tree on Saturday night, killing a Derry teen who was riding as a passenger in the car and injuring the teenaged driver. Derry police say 17-yearold Korey Traficante of 158 Fordway St. Extension was killed when he was partially ejected from a 1998 Saturn after the vehicle crashed into a tree just before 11 p.m. on Saturday. according to Derry police Capt. Vern Thomas. The vehicle’s driver, 17year-old Cameron Dearborn of 5 Frost Road, was airlifted to Beth Israel-Deaconess Medical Center in Boston after the crash with reports of a back injury, Thomas said. Dearborn was also not wearing a safety belt at the time of the crash, he said. The first officer to arrive on scene Saturday night reported finding the vehicle sitting on its right side in the yard at 20 Frost Road. Traficante had been partially ejected from the vehicle and was unresponsive, Thomas said. Dearborn was found conscious, but trapped inside the car. After being extricated from the vehicle, Dearborn was taken to West Running Brook Middle School where he was airlifted to the Boston hospital. Hospital staff had no information on Dearborn’s condition on Monday afternoon. Jack Goterch, who lives at 20 Frost Road, said investigators remained at the scene early into Sunday morning and returned on Monday afternoon, when investigators spent several hours recreating skid marks on the stretch of Frost Road, he said. It was Goterch who first called 911 to report the crash just before 11 p.m., after hearing a screech and thump. Friends and family returned to the scene Sunday and Monday, laying flowers, candles and notes in Traficante’s memory on a tree in front of the 20 Frost Road home. And friends say the Pinkerton Academy student was upbeat and popular among his classmates. Ritcey said Traficante and Dearborn were good friends who bonded over a shared love of cars. A woman answering the door at Dearborn’s address Monday evening declined to comment on Dearborn’s condition. Both Traficante and Dearborn are enrolled at Pinkerton Academy through the school’s Alternative Learning Center, which offers independent study courses on a separate campus to help students who have struggled in a traditional classroom setting. According to school staff, Traficante was a senior and Dearborn a junior. Grief counselors were on hand Monday at Pinkerton Academy to help students deal with the loss and a moment of silence was held at the beginning of the day, said Robin Perrin, who spoke on behalf of the school on Monday. “It’s always difficult to face the death of a student and today the entire Pinkerton community is in mourning for the loss of one in our community,” Perrin said on Monday. Sara White, a former art teacher of Traficante’s, described the teen as a passionate student who was always quick to help. “He cared deeply about graduating from Pinkerton and being able to make his parents proud,” White said Monday. “When Korey completed something he was proud of, his smile and energy could be felt by everyone. And 15-year-old Stefan Burnett said he and his friends will try to keep Traficante’s positive spirit alive in the difficult days to come. “He’s not a sad kind of kid, so I don’t think that’s what he’d want,” Burnett said while visiting the Frost Road site Monday. Calling hours for Traficante will be held from 5 to 8 p.m. Friday at Peabody Funeral Homes and Crematorium at 15 Birch St. in Derry. Funeral services will begin at 10 a.m. Saturday at the funeral home, with a burial to follow in Forest Hill Cemetery in East Derry. Derry police are continuing to investigate the incident. Anyone with information about the crash or Dearborn and Traficante’s whereabouts earlier on Saturday evening is asked to call the Derry Police Accident Investigation Unit at 432-6111. Click here to link to Korey Traficante's obituary and information about services at Peabody Funeral Home. works with her rescued doberman, Charlie. DERRY -- Like their human counterparts, young dogs need discipline, consistency and a bit of practice if they’re going to fit in socially. “It’s a drop-in class, like yoga for dogs,” said Donna Lind, who when not working in the office at Fortunate K-9 Dog and Owner Training School, is working one-on-one with her own German shepherd, Siren, who was developing some bad habits. Yesterday’s drop-in middle school obedience class is meant for dogs who, like Siren, got the basics down but need to play well with others. Downward- facing dog was a given — the rest of their hour-long session included exercises that tested their ability to connect with and respond to their owners. beyond the puppy stage but still need to work on the finer points of obedience. Instructor Liz Cleaves stands in the center of the training room, like the sun to a small universe of revolving dogs who, along with their masters, are put through the paces. After doing several laps in regular and then double time, Cleaves has the dogs sit in place. Then, one by one, each dog must walk a serpentine route around the others, without being distracted. “OK Charles-No-Longer-In-Charge, your turn,” says Cleaves, which prompts a handsome Doberman pinscher and his human, Chris Mechalides of Tyngsborough, Mass., to walk the walk past his peers, including four German shepherds, another doberman, a pit bull, a sheltie and a Weimaraner mix. “Without the help of Fortunate K-9, Charles wouldn’t be able to do what he’s doing,” said Mechalides. She rescued the 2-year-old dog from the Lowell (Mass.) Humane Society when he was just 9 months old. Kristal Tremblay of Chester said she sought out a group class for her pit bull, Jessie, a retired show dog who has earned his Canine Good Citizen award, which means a dog is a “contributing member of society,” according to the American Kennel Club. While the 10-item checklist of tasks needed to be earn your dog citizenship award is rigorous, it is a particularly proud achievement for a pit bull owner, given the bad rap pit bulls generally get from the general public, said Tremblay. “Most people don’t understand that they were bred to fight other dogs, but not people. Back then, if they did bite a human, they were shot. What’s changed is that people want tough dogs, they want them to be intimidating to people, and they’re bred to be that way,” said Tremblay. During a short break in the action, Tremblay’s pit bull finds a comfortable spot to recline on the mat, next to two German shepherds and a doberman. For a bunch of adolescent dogs, they are civilized — paying little attention to the newbie, a 9-month-old Sheltie named Riley who at about 12 pounds weighs about a tenth of what the shepherds weigh. “He’s still a typical puppy — he was pulling me around and nipping at my heels, but he’s doing great on his first day of class,” said Riley’s owner, Andrea Schneebaum of Derry. Jackie Ouellette of Salem said her German shepherd, Zach, was a loveable puppy but became aggressive after being hit by a car at about 8 months of age. “He has really come around,” said Ouellette, an experienced dog trainer herself, who said the classes reinforced for her the importance of being in control. “Last week there was a small, aggressive dog who came to class and under other circumstances, Zach would not have behaved himself. But because of his training, he just sat there like he was supposed to and didn’t go after the dog,” said Ouellette. Joanne Collins of Hampstead said her 9-month-old German shepherd, Ryker, is as well behaved as a full-sized dog with a puppy brain can be.